Old aunts used to come up to me at weddings, poking mein the ribs and cackling, telling me, "You're next." They stopped after I started doing the same thing tothem at funerals. After his marriage broke up, my manager became very philosophical. "I guess it was in our genes," he sighed. "Her sign is the one for earth. Mine is the one for water. Together we made mud." 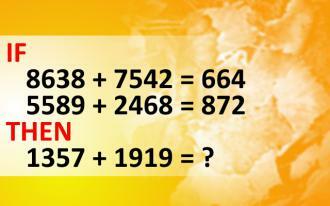 If 8638+7542=664 and 5589+2468=872 then 1357+1919=?